Legal Trends Shaping Private Schooling discusses admissions and hiring practices, conflicts between school rules and legislation, and concerns when spending funds. While certain legal issues affect all educational institutions, there are several crucial differences between public schools and private schools which include independent K-12 schools as well as private colleges and universities. Questions of financial funding and proper transparency regarding donors often occur. Even without federal or state funding, schools must consider how to prevent or respond to charges of discrimination from faculty, staff, or students. Particularly when student life is residential, questions about on-campus criminal activity and how to handle it also frequently arise. 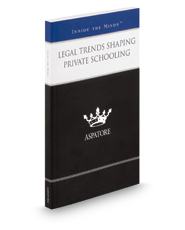 Legal Trends Shaping Private Schooling offers guidance from top lawyers about all these issues and more. The authors concentrate on some of the most pressing controversies in educational policies today, such as transgender discrimination and social media use. Legal Trends Shaping Private Schooling provides an education in itself, one which will greatly benefit both lawyers and school administrators.